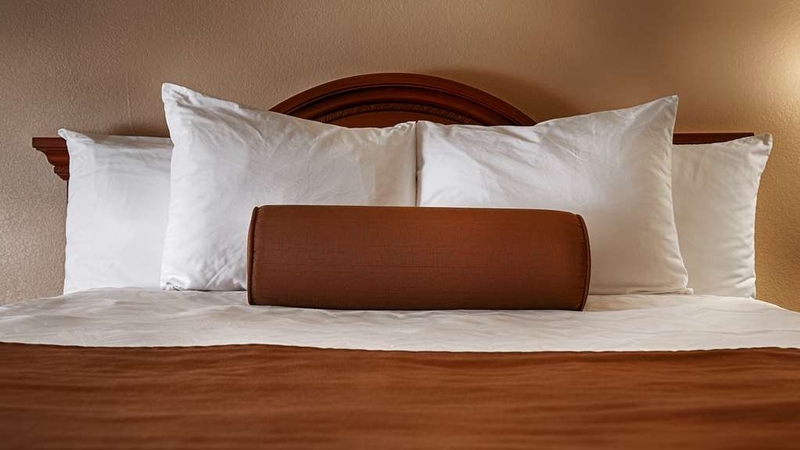 The Best Western Heritage Inn is ideally located in the center of Concord. Come and experience our hotel near the major tourist attractions. Best price guaranteed and exclusive deals. Welcome to the Best Western Heritage Inn! 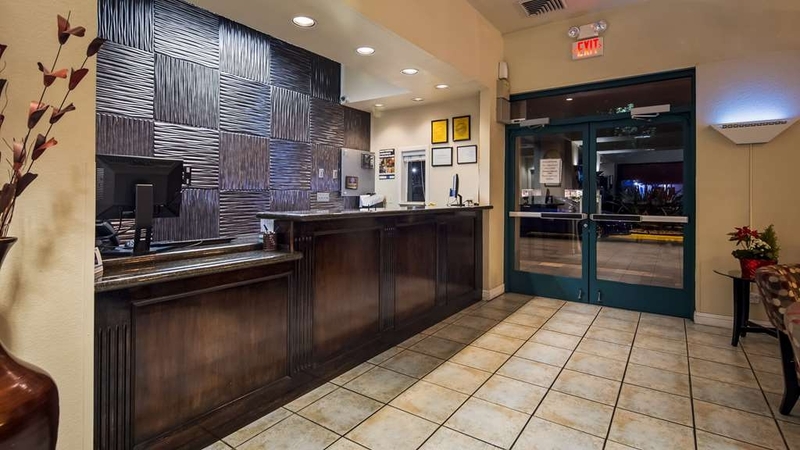 Close proximity to East Bay and Walnut Creek make our Concord hotel popular with all types of travelers, from families on vacations to those on romantic escapes. Mt. Diablo is also close to Concord, CA and a favorite for outdoor enthusiasts. However, it's the superior customer service at our property that really shines. The staff makes you feel at home, and with restaurants within walking distance, relaxation comes easily. We care and listen to all of our guests, and are happy to provide recommendations on things to do, places to visit and the best dining options. 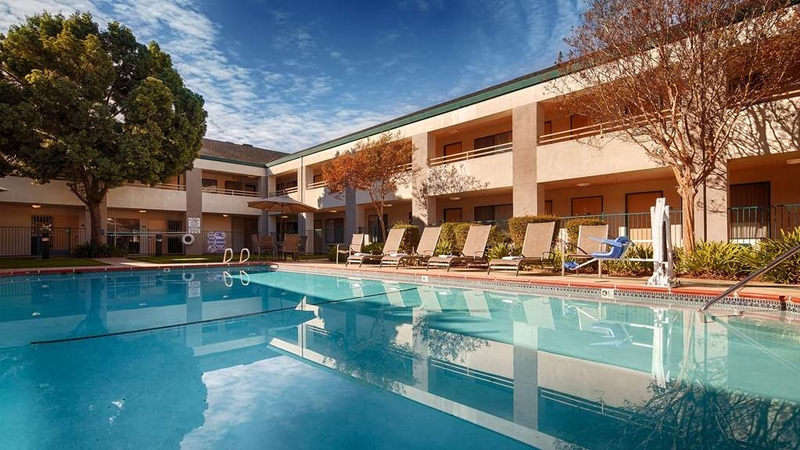 Whether you're here for a golf getaway or you're taking the whole family to Waterworld, staying at the right Concord, CA hotel can make all the difference. Festivals abound year-round from Oktoberfest in the autumn to the many wine festivals nearby. Take one of the tours or ask a helpful staff member about the must-try wineries. Located between San Francisco and Napa, downtown Concord offers a wide variety of authentic cuisines from Italian to Mexican, Japanese to American and more. Military families who stay with us especially enjoy the many choices there's sure to be something for everyone. 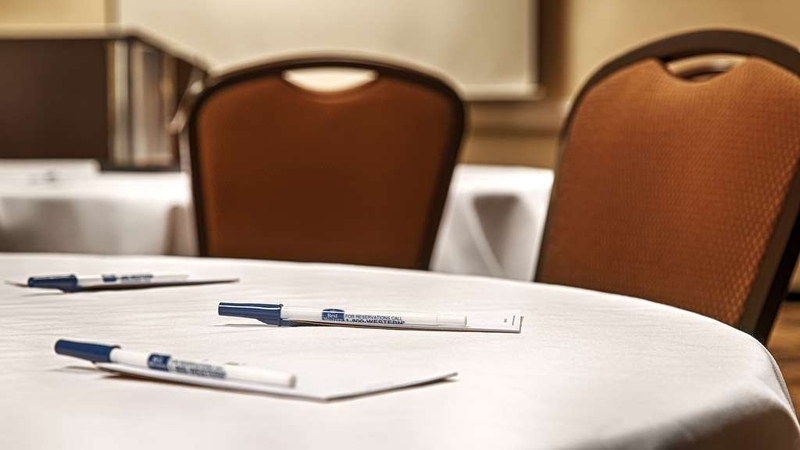 Whether you're here for business with the refineries or on location with construction companies, our Concord hotel makes business travel a little easier and much more enjoyable. The nearby Concord Pavilion is the hot spot for concerts and events year-round. Find out what's happening while you're in town and you're guaranteed to be in for a real treat. The charm of the town gives it a homey feel that embraces every traveler. Whether you'll be here for a night or a season, you deserve to be treated like part of the family. 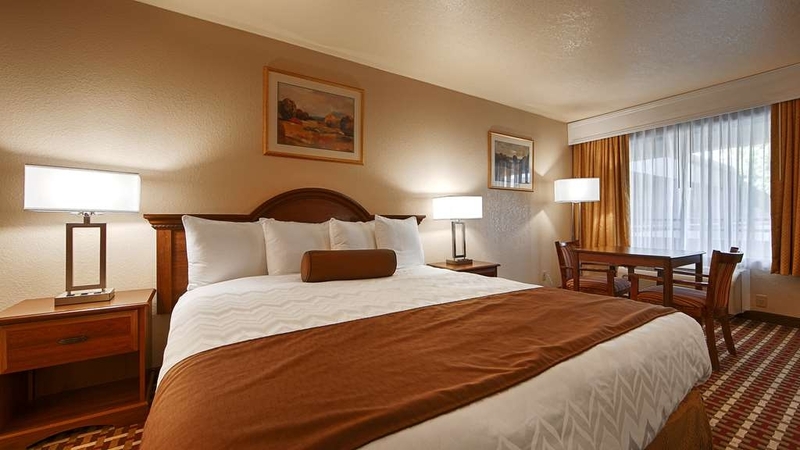 Reserve your upcoming stay at the Best Western Heritage Inn today! This property is clean. I like that both room and grounds were spotless. Room fixtures are mostly up to date. Not a fan of outdoor entry into a room. Comfortable bed. Pillows are too small. Breakfast was good. All the basics there. 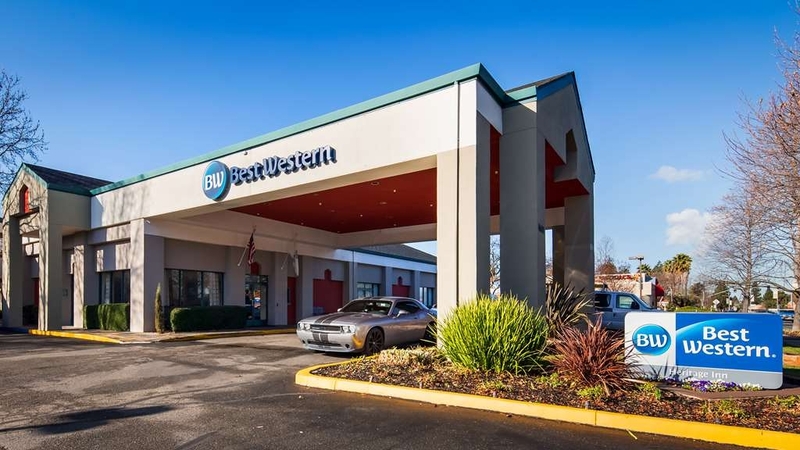 We've been BEST WESTERN customers for 20+ years. This locations doesn't deserve to represent the brand. A construction crew was working on a leaking roof that impacted multiple rooms, loud banging ALL day, no working TV's in both of our rooms and took ten minutes for the hot water to work. We were never warned of these issues. We left after only being at the hotel eight hours total and stayed with family nearby who actually told us it was a “crappy” hotel. We gave them a chance because it was a Best Western. 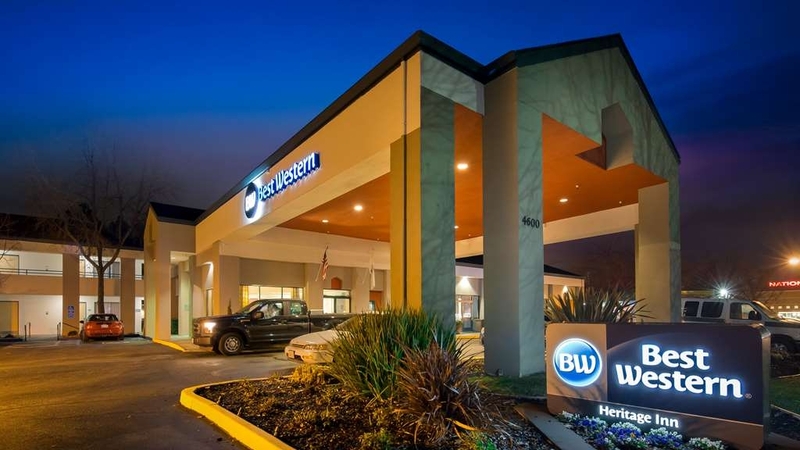 "Always a pleasant stay at Best Western Hotel"
Always a pleasant stay at Best Western Hotel. Rooms were clean, Breakfast was hot and ready and the lounge had plenty of room. Check in was fast and I was told about everything available to me. I would stay there in the future. We stayed in room 160. Nice room with good wiFi, Refrigerator and very clean. The breakfast was good. The only problem was availability of hot water in the shower during peak am times. This is a good location for business people..
Nice hotel. My boyfriend and I aren't to picky. We didn't spend much time in the room except to sleep. The breakfast was surprisingly good! His family also stayed there and they liked the stay as well. "Familiar story, fraudulent credit card charges after stay"
I've never written a review before but felt the need to share that several days after my stay in late Oct 2018 I had fraudulent charges on my credit card and had to close the account. Stay was satisfactory. Room seemed clean and unremarkable. Interaction with staff was friendly but maybe their hand was in my wallet, so to speak. Checked in after 11pm so lobby was closed and credit card was passed through outside window. "OK Motel, BUT.... had my creditcard details stolen." Stayed two nights end October. Chose it, as it was reasonably priced, it was in the area we needed to be in to visit friends, and I am a BW member. Motel is ok, room was ok ( though We had ants in the bathroom), but not the standard I usually find at BW. Breakfast was included in room price, and was adequate. So OK for a place to sleep. Sadly, I had my credit card details stolen at the hotel. Used this particular card by mistake when booking, so I am sure that it happened here. Someone has been using it in the area around the hotel from the day I checked out. Frustrating to have to deal with bank etc. and not something you should have to put up with from a decent hotel chain! To the management: You seriously have to check your routines and emplyees! And please don't come up withe the “we know our emplyees and it is imposible”! Obviously it is not. To the rest of you considering to stay here: Our room was ok for staying a few nights, but if you choose to do so - Pay cash! The hotel is nice but my Credit Card number was stolen and was tried to be used in Oakland California just days after we stayed here (my bank declined the charge as a fraud purchase). My card is only used when we travel and we have not used it recently except at this hotel which is quite a coincidence. Like I said the hotel is nice, the bed is comfortable and the breakfast is good... just be careful when using your credit card! It was nice and the neighborhood was decent. There are a few fast food options close by. I loved the whirlpool tub and the room was huge. The TV was big too. It was too cold for the pool, but it looked nice and clean. The hot tub was not working. Breakfast was the usual. "Got my credit card # stolen here." First off I'd like to say that this was a first for me. My bank contacted me several days after I stayed at the Best Western Heritage Inn and let me know that my business credit card was being used all around Concord and Antioch. I do not live anywhere near the area. I live hours away. I checked my purse and I still had my credit card. The only place I had used this card during the last month-and-a-half was at the Heritage Inn. I canceled the card and called the hotel right away to let them know that my credit card number has been stolen at their hotel. I was not looking for them to do anything for me what I wanted was an investigation to see what happened during my check in to see if there was an employee who was stealing customers credit card numbers. Or a hack.I could not get through and I called corporate who filed a claim. When the Best Western Heritage Inn Concord called me they were very defensive saying they knew all their employees and none of them would have done it. I rmexplained that it was the only place I had used the card and that I still had possession of the card and that the card had only been used in their area. I also explained that I was not looking for any restitution or anything for me I just wanted them to investigate it. Their defensiveness let me know that they weren't going to do anything about it and I want others who stay here to keep eyes on their cc at all times and be aware. "This hotel is a hole"
WATCH OUT!!! They have their windows without locks. You can be robbed. It happened to us. We got all out suitcases and shopping bags stolen. We lost passports, computers, gifts, money. Stay away from this place. Bad response from management. STAY AWAY!!!! Dear Mona We are very sad to hear that you had to go through the problem you mentioned. Just to let you know that we did all our investigation and also the police were involved in the investigation. However, according to the police there was no force entry to the room. All our rooms are equipped with double window locks which makes it impossible to open from outside.The only way to the room is through the door or breaking the window. Again, I thank you very much for the review. Sincerely Management. "Good value, but poor nights sleep"
The hotel is located on a very busy road but there are options of restaurants along this road within walking distance. However, it is a good 3 mile drive to the lively Downtown area (not walkable). We had a room on the ground floor opposite the pool and unfortunately we were kept awake by the guest(s) directly above us as you could here them walking about, talking and their TV. The pool area is nice to relax at, but the hot tub was not in working order during our stay. Free parking on site. We stayed here for a total of 5 nights as we moved our son to the area. We had a double queen room on first floor. It was clean & beds were comfy. There was a loud noise in the wall which woke me up twice during our first night. I mentioned to desk & was told maintenance would look at it. Well, it continued but we just got used to it. My husband is a plumber & said it was pipes in the wall but it was quite loud. There are restaurants close by. It has outside entrances to the rooms & the rooms go all the way around the pool which was also nice. Our room was recently refurbished & the decor was great (new carpet & decor). The breakfast area was not the cleanest, the waffle iron had dough scraped from the iron all around it during our entire stay. There were times when things were not restocked timely (utensils & OJ gone 2 days). "Very low quality for the price"
We stayed for the location, to visit family in Concord. It's on a main street with lots of options for markets and restaurants nearby. However, for the price, we were disappointed in the low quality. The room was very dated, patches and repairs made roughly. However, it did have a bed, AC, hot water, and a small refrigerator. The room was a good size. The room was not very clean when we arrived. There were candy wrappers in the corner of the room, and they weren't ours. The basic toiletries you expect for the price we paid were a joke. There was a dispenser of body wash, and one of shampoo in the shower. That's all. Not even a bar of soap by the sink to wash your hands. When we called, we were told you were supposed to walk to the shower and use the body wash. Really? The rooms are noisy. The ones facing the interior pool have noise from dozens of screaming kids in the unheated pool. Rooms facing out to the parking lot - well the parking lot didn't appear that quiet or safe. At one time multiple police cars were there dealing with some issue. The complimentary breakfast was the basic breakfast we expected, no complaints there. If you are looking for the absolute basics - just a place to sleep and take a shower - and bring your own bar of soap, you'll do okay. Overall, it was a room we would have expected if paying $40/night, not over $100. Hi CarolSLC, I'm sad to hear that things didn't go down as you expected. This is not by any means reflective of our standards of service and customer satisfaction. We are already working on tackling the problem as I write this, and Hope that you will give us another chance and book again. Looking forward to meeting and exceeding your expectations in future. Sincerely Management. We've had 5 nights here at the start of our trip away from the bustle of the City. The room is large and clean. A preference would be for more hooks and rails to put wet towels and swimmers on. The pool is clean although cold. There is a Nation Burgers on the corner which is handy plus lots of restaurants and shops around. A good choice at breakfast. Parking is good. Wi-Fi speed excellent. Quiet. We have been visiting local breweries/taphouses and there is an excellent place just opened down the road called the Concord Taphouse. All in all, happy with our stay. I stayed here with family while attending a concert at the Concord Pavilion. It was about 10 minutes away, so very conveniently located and an easy drive or Uber/Lyft ride away. We had a room with 2 beds. The room we stayed in was so run down, I'm not sure if it was indicative of what the rest of the rooms are like. It was not what I would expect from the Best Western brand. The room was old and and smelled of cigarettes and marijuana. There was a huge stain on the ottoman which was pretty gross. The shower had mildew on the curtain. The lock on the window had been broken off. We called the front desk and a maintenance man arrived within seconds to fix it. The ladies working at the front desk were amazing, very nice and customer service oriented, as was the maintenance man. We slept in and did not eat the free breakfast that came with our stay. Not sure I would stay here again. I was definitely disappointed in the quality of the accommodations. First, I almost never submit negative reviews but in this case I thought others should know that this hotel doesn't live up to the Best Western name and has now led me to question that standard. It does have a lovely outdoor pool area. The room we were given, however, was in pretty bad shape. I'm not finicky or used to high-end accommodations, but I had trouble with the worn, sticky-in-places carpet, the badly repaired bathroom floor and wall (grout and plaster slapped on), and the fact that both the shower and sink had hot and cold reversed, something easily fixed. The whole room felt dingy, worn, and uncared for. I stayed at this hotel last night with my wife and son. I was told I was being charged $199.00 + tax. This was what was agreed upon. I was charged $326 (I suppose this is $199 + tax +$100 deposit). Then, on check out, I was charged ANOTHER $226.00 - total, still on card, being > $500! How do you like that? Me: Not much at all! More than $500 for a basic room, and with people hollering outside all night, and stomping around a floor above, not worth it! Next time I'll choose anything else, but I'll sleep in the car before I go back to a Best Western! Checking in, the receptionist wasn't the most pleasant. She rudely told me I can't use my member number for rewards because I booked through priceline. I went through my work/corporate so I had no idea. 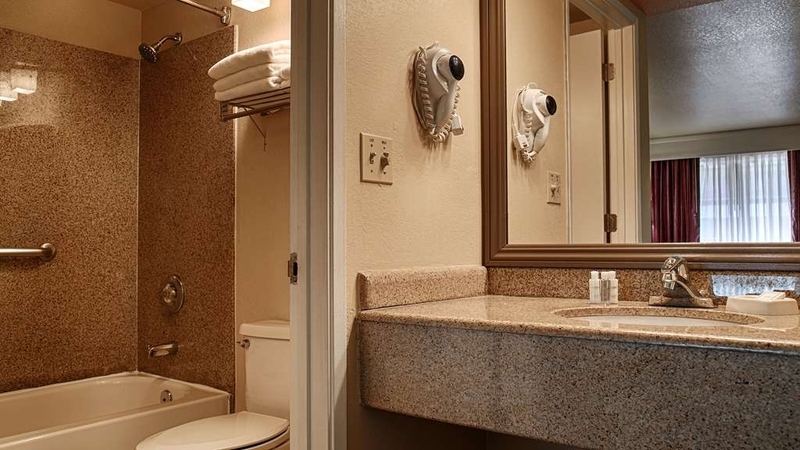 The room is spacious and it's nice to have two sinks. The bed was comfortable. The jetted tub was roomy but the jets didn't work. Taking a shower was an event. It would go from ice cold to scalding hot without touching the dial. The a/c unit had its own ideas. The thermostat wouldn't go up past 80 and I'm always cold. I would turn it off and it would still kick on and off randomly. Others cigarette and marijuana smoke would fill my room throughout the day. The breakfast wasn't anything great; the standard. Staff decided to be the wake up call each morning at 5:30. Banging things and just being loud in the walkways. Glad I was already up each day for work. The kicker: I was traveling alone but had to share my room the last two nights with Mickey Mouse. I told the desk when I left but they didn't seem too concerned. At least I didn't get charged for him. Affordable price, staff was accommodating, typical continental breakfast yet served hot and fresh. Very quiet and lovely pool. Near a variety of restaurants and shopping. Really enjoyed the stay, good choice. Only reason it didn't get 4, is cause I've been in much better. Room was large , clean, comfortable. A/c worked amazing. They have a pool. Nations hamburgers is good and in same lot. Jacuzzi tubs in many rooms (didn't use it). Check in/out was smooth and painless. Breakfast was alright, waffles, buiskets/gravy, several cereal...,...but lacked plastic knives. And heard other guest asking for non sugar free syrup....lacked that. But overall very nice facility that I will use again. Btw. I'm in hotels 365 days a year. This place is slightly above par for the price in this area. Not too impressed with the manager. Very insensitive. My bank was charged 4 hours before check In. And then they tripled charged my card at check in and I had to wait 5 days to clear my account. So disappointed. I stayed at the Best Western for a little under two weeks with my family. I have no faults with the receptionists and the breakfast staff, but I am unhappy with my visit as I had an expensive perfume go missing from my hotel room. I did report the issue to the receptionist who was working at the time, and they did supposedly check with their cleaners to see if they had seen a perfume, of course it was denied. I never took my perfume out of the hotel room, so how can it just vanish? This was my first time to the US and it has now put me off staying in a Best Western again which is a real shame. Cannot fault everyone else who works at the hotel as they were incredibly friendly and helpful, just a shame my perfume went missing from my room which is something you hope never happens to you. All I can recommend is any expensive items keep locked away in a padlocked suitcase or take the items with you. I am glad I didn't leave any other valuables in the room as they may just 'vanish' too. "Very good value better than Marriott!!" Very nice and clean hotel with caring staff. The decor was updated and the facilities were good. The staff were eager to help and make your stay memorable. Why pay over $200 a night at Marriott and some rooms are not even updated in some locations. For today's lifestyle having a microwave and refrigerator should be an essential in all rooms which the Best Western in this location had. I travel extensively for both business and leisure and I give a positive heads up for this hotel. Very impressed. Located only a half a mile from Concord's town square, this small motel offers excellent rooms, a swimming pool and a full, free breakfast. Plenty of parking, and lots of restaurants and bars within walking distance. "Hotel Staff excelled in customer Service!!" The room was spacious and nice. The staff was friendly and helpful. The breakfast was decent. The hotel is closed to a lot of restaurants. The only downside was the hot tub was closed and the pool was unheated. We stayed here as we were on a weekend trip with other families for a bowling trip. We all decided to stay in one hotel. Check in went smooth and the staff was friendly. Our room was located right at the top of the stairs (231, I believe) so anytime someone loud was going up or down the stairs, we unfortuately heard them through the door. There was a refrigerator and microwave in the room, which is something that I always appreciate. The bed was very creaky and not terribly comfortable. The water in the shower was very hard to turn on (it actually took me a minute to get it on) and the bathtub did not drain the water quickly as I showered so I was standing in an inch or so of water while I showered. The night we stayed the hotel was completely booked so I guess that is why when we tried to get breakfast the next day it was very crowded. The staff opened up another room for people to eat in but the area where you get the food was crowded so we just decided to skip it. There were many restaurants close by and a grocery store so the location was good. My biggest complaint about this hotel (and why I will choose not to stay here again) is that we could smell marijuana anytime we stepped outside of our room. At 9:30 in the morning when we left the room to get breakfast, our neighbors were sitting right outside their room smoking it so it really hit us in the face as we walked out the door and we could smell it the whole walk to and from breakfast. I know smoking marijuana is legal now in California but as a non-smoker (even of cigarettes) I will choose to stay at a hotel that either has a no smoking policy, smoking area, or that has inside rooms so that I do not end up in this situation again. I spoke to several other families that we traveled with and they all had the same complaint about this (one even said the smell was wafting into thier room). "Good Value & Great Staff"
This BW is striving to compete in the Concord-Walnut Creek area. Their hotel appears to be upgrading its building and rooms. Very neat staff, from front desk to maintenance/housekeeping to morning breakfast. Very quiet yet close to shopping, colleges, and more! "Good location, close to a friend. " We had no issues checking in, but a few hours later some issues arose. They had marked us in another room and gave a lady a key to our room. Good thing we were in there. At first the staff treated us like we were in the wrong, till I threatened to go elsewhere, then they apologized. We had no issues after that. The breakfast was delicious, the hostess was really kind. We were also so close to restaurants and grocery stores, so we could just walk everywhere. We got to know this city well during our few days there. My only piece of advice.. make sure they have your name and room number right. So you don't end up in a hateful argument. I admit we must have come during a shift change, but they did apologize for the way they had acted. I think more than anything, the lady who barged in and yelled at us, had upset the staff more than anything and then they released a bit of it on us. I will come back here though. "Older place but the room smelled like smoke"
We were here for business. Walking distance to eating. Good place, Hunan House, family run. Would go there again. This is an older hotel with adequate accommodations. The room smelled like smoke, likely from smoke coming under the door. If it weren't for that, I would have given it better reviews. Big room. They should have a smoking area away from the doors. The bed was good and the pillows were very comfortable. Quiet place, otherwise. I would come back if they could fix the smoke situation. good location, however very old hotel with water damage to ceilings on 2nd floor (top floor) and when it rained the drips sounded amplified like someone knocking at my door (even with my ear plugs in). also doors open to exterior hallway which is cement and stucco and VERY loud. Everyone's footsteps and voices were amplified and sounded like pounding and yelling. Terrible construction. Needs to be demolished. "Clean rooms, friendly and helpful staff"
Comfy bed, large room, always clean and fresh. Front desk staff extremely nice and helpful. I could pick at some things, but overall, I'd stay there again if in Concord. The also have a security guard on duty overnight. 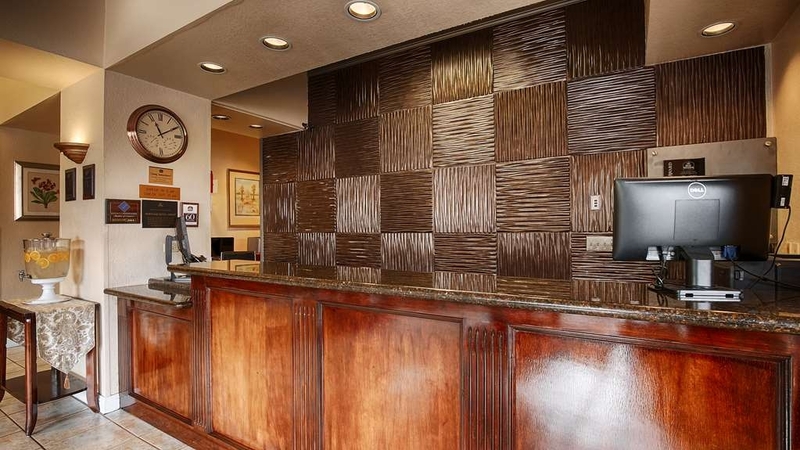 "Great rooms, beautifully maintained hotel, friendly staff"
The Best Western in Concord is a lovely place to stay if you are looking for lodging in the area. The rooms are big and beautifully maintained. The grounds are pristine. The front desk staff was friendly, warm, and helpful. My only critique was the quality of the free breakfast. If that's important to you, there are plenty of other places within easy walking distance where you could eat. "Stay at BW in Concord"
Our stay was overall very nice. The breakfast was not bad and got us off to a good start. One family however started packing away enough food to feed their family for a week one morning. Our shower was difficult to turn on/off and adjust the temp which was reported but was not fixed during our stay. I was excited to see that I had a Jacuzzi tub and not realize that it was an internal plug system (my fault), I will know better next time. It would be beneficial if there was a phone book in the room so we can look up businesses, not everyone has a smart phone. Our staycation was nice. We had at least one interesting issue but as soon as we called they had someone coming to fix it, and the person was there fairly quickly after the call ended. This was our last weekend trip before our wedding in 4 months, and I could say it we seemed to have an enjoyable time. "Good room at a great price." The beds were very comfortable beds and the internet & TV worked great. My daughter I stayed here for just one night will attending a swim meet nearby. Price was about $30 less than other hotels I checked in the area. I have stayed at this property before during renovations and have decided it is best to wait until they are completed. Just small issues that I have had now twice at this property will make me choose a different option when in the area. I have asked to be contacted when renovations are complete so that I can return. Room had everything we needed. Bedding was extremely comfortable. Internet very fast. Front desk staff good. Room large and nice. Fridge and microwave. Reasonable price. I would recommend this to anyone. A little out of the way but it was a pleasure staying here. The staff was all smiles with a warm welcome. The property was clean and seemed to be newly remodeled. The room was big and spacious and the pool was clean and clear. The bed and the amenities were perfect. I would recommend this property for an overnight or for a few days. "An amazing hotel, worth it for sure"
I stayed at the Heritage Inn last weekend, and I have nothing but good things to say. Upon checking I was greeted as a Diamond Select member, and upgraded with priority checkin. My room was flawless. No issues with cleanliness. I read in other reviews that there was no hot water, and this was not the case with us! We had hot water all day, every day. We didn't get to check out the breakfast, but from what we could tell it was pleasant. The spa room didn't open for us, but no worries. Overall, this stay was a perfect 10. Now when I go to visit I'm definitely staying with this property! The bed and the room were very nice. Quiet atmosphere friendly staff. The breakfast was not the best in the industry. Ended up not eating there. Grounds were kept up and the place was busy with a lot of workers. Have stayed here before. Good location near were I needed to go and a lot of restaurants and stores near by. Clean and quiet. I do generally get a room around the pool which is insulated from any noise that may be around the parking lot and road. Nice breakfast choices. Always a good choice, when your in the neighborhood. "Terrible experience! No hot waterPoints but I have not gotten those to date and this was a week ago." The location of the hotel wad excellent, as well as the room location. It was so quiet that we felt like we were the only people on the se ond floor. The room was very spacious with refrigerator and microwave as well as a separate sink in a little bar area. There was also a table and chairs, in addition to a small desk and chair. It was a very comfortable room. Although the outside was clean and well lighted, couldn't say the same for the inside of the room. The mattress was so bad it felt like someone hit us all over our bodies. Also the pipes were so loud we heard every time someone took a shower or flushed a toilet. We usually enjoy staying at a Best Western but not this time. This hotel has issues with hot water and the staff are not very helpful especially when it come to Ellit members. Which is very unfortunate. I have been using this hotel for the passed three years and it seems like that the management and the staff are no longer passionate about hotel customer service. Off a fairly busy street, but our room was on the inside and very quiet. Plenty of parking and easy access to room. There is a small workout room which was quite nice also. The breakfast is always a nice treat, and they provide something for almost every taste. Fruit infused water and Coffee are always available in the lobby. 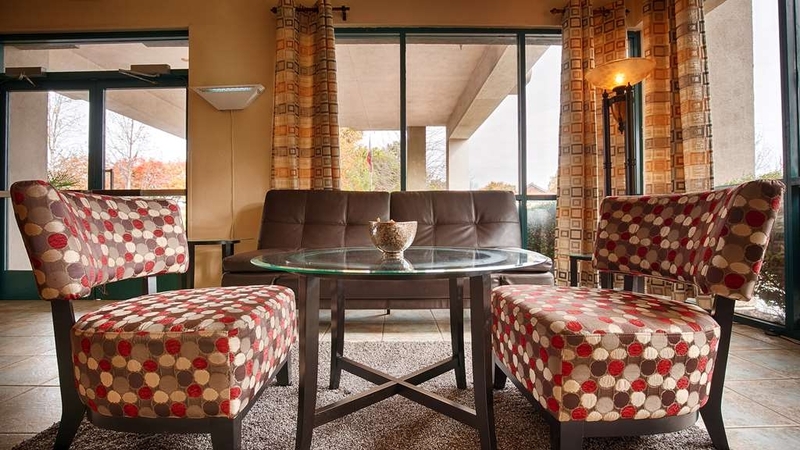 "Very Comfortable & great service"
We thoroughly enjoyed our stay here. Beautiful Garden area & pool. Breakfast delicious & great selection. Fruit flavored water with different fruits every day. Attentive service and front desk staff. Very safe area with many local restaurants & shops. Worth a trip to the small quaint town of Clayton not far from hotel, mountains & beauty. Main issue was the location. Not a safe area. Room was really dark inside. 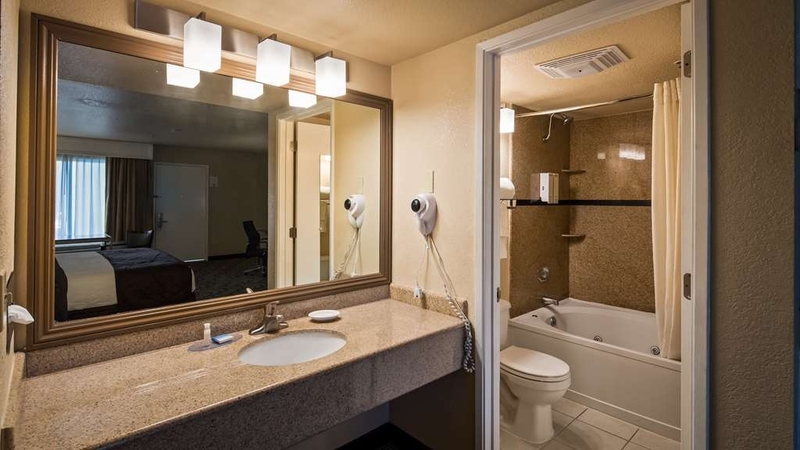 Bathroom sink in the room instead of bathroom. A bit impractical...Hotel facilities and staff were great. The room was clean. We are not very high maintenance so this is weird for me to right a some what poor review. However, we had lukewarm water at best during our stay for showering. Every time we plugged in a small appliance (iron, blow dryer, etc) the lights dimmed and flickers. The tub was supposed to be a whirlpool tub but the jets looked funky so we did not attempt to use it. We also had ants around the door frame. Aside from this, the room was clean and ac worked pretty well. "this is not BEST, maybe it is western...."
Although the price was reasonable for the area, hotel was only adequate. Rooms were spacious and clean, but bathroom was aged and showed enormous amounts of caulking, which was cracked. Shower pressure was horrible, with the occasional cold only during the shower. TV remote did not work and TV was almost unwatchable until it warmed up for 30min. Service was good as they allowed us to check out one hour late. Breakfast was crowded, one waffle maker so lines were long, eggs were uneatable and not a lot of other options. Location was 3 miles from downtown, but had some fast food and grocery stores nearby. The staff is very friendly and helpful. It was a good stay. The pool was nice and the breakfast was really good. It's close to different types of restaurants. The rooms are clean and really good size. "Come only if you have to..."
I don't know if we have high standards, but this hotel was very dirty. Staff was nice but the overall quality of the room was very poor. The floors/carpet was very dirty where our feet was quickly turned black after walking on it for a minute. The room smelt bad as well. The drain in our bathtub was not working properly as well and took nearly an hour to drain. However, the staff was very nice and accomidating. I found them to go out of their way to help us. This was the saving grace of this hotel. Overall, I would not want to stay here again. We only chose this place becuase we thought our group was staying there but apparently it was another Best Western. You can stay here for the convienence of the location but not if you want to enjoy the property. Needed a good nights rest before medical tests and BW of Concord came through with flying colors. Not only was this hotel located near hospital it afforded us a peaceful night's rest and a delicious breakfast to get our day started right. We only stay at BW's because who else can compete with the BEST Westerns!! We recently stayed here (2 rooms) to attend a family wedding nearby. The staff were wonderful, from booking to check out. Our rooms were well equipped and included a fridge and microwave. The pool area was lovely, we enjoyed sitting out in the sun. The only minor issue was that 3 out of the 4 days, housekeeping only left decaf coffee for us to make in the room, no regular packets. It's just a little thing but for those of us who like to get some caffeine before we head out to the lobby for breakfast, it was a bit of a disappointment. However, the coffee that was available in the lobby was some of the best (stronger than most) hotel coffee I've had so overall it was fine. "Theres no such thing as Perfect"
This was a nice trip. a few bumps here and there, but overall it is a good place. The price is good for the location, and the staff are friendly. I make this my usual staycation with my betrothed, and it's nice and close. "Experience of a bad experience resolved"
There was a construction crew staying in the next room by us and they were playing music loud and drinking beer outside their room. The staff took care of the problem. We moved to a different room. It was not the staff problem, it was the customer bad behavior. Horrible Hotel!!! The staff was very nice really the only thing I can say nice is they are nice and friendly. The room smelled and was dirty with a bad aunt problem. Found used kleenex in bed.... gross!!! We stayed 2 nights. The beds where comfortable. The pillows where not as comfy. Breakfast was good, a lot of different options. The swimming pool was perfect for the kids they had fun. The staff was great at check in and check out. The only downside is we got a non smoking room, but it still smelled like smoke, otherwise it's a clean hotel and in a great area with a lot of restaurants near by. Upon arrival there was a Hugh party in progress with very loud music. Was told by the rude desk person that they rent out the auditorium for different events. We tried to cancel our reservation but was told we would still be charged the full amount for the room. Our handicap room was terrible. The shower leaked into the entire bathroom floor which was very dangerous for two handicapped people. Just as we went to bed the people above us started jumping up and down on the floor. Horrible experience!!! Upon having issues with our stay, I was berated by management. I called the 800 number for BW and informed that the GM would call me the next day. Issues are still not resolved. I would suggest staying somewhere else. "they do NOT accept pets, Tripadvisor, please change it"
Stayed for 10 days at this Hotel. The staff at the front desk were a blast,they made my stay even more enjoyable. The location is close to a large number of restaurants and stores. I would strongly advise this facility! "Good value , considering, for basic lodging"
First, it's important to note that hotels in the extended San Francisco/Oakland area are quite pricey. For someone who previously lived in the mid-west, sticker shock was a real issue for me. For a room costing $130+ per night I ordinarily would expect much more. I was disappointed to find this was a motel - with all roome accessed from the parking lot - rather than a hotel. In line with that, it was an older property. That said, once I got used to it it was fine, albeit on a modest scale. Coffee was good, which to me buys a lot of forgiveness. Heritage Hotel Group needs to up its game for business travelers. Heritage Hotel Group needs to up its game for business travelers. Heritage Hptel Group needs to up its game for business travelers. Heritage Hotel Group needs to up its game for business travelers. "Nice place for a good price!" We stayed one night while visiting family members in the area. The hotel was clean. Lobby very nice. The price was good for the bay area. The breakfast was ok. It was convenient and close to our family that lives in the area. Would definitely consider if in the area again. "MC Legends - Baseball Team"
We were here with 10 families. The 12 year old boys were here to play in a baseball tournament in Martinez. There many stores nearby groceries, gas stations, banks, and restaurants. This location was only 12 miles from the field but the drive was about 25 minutes. 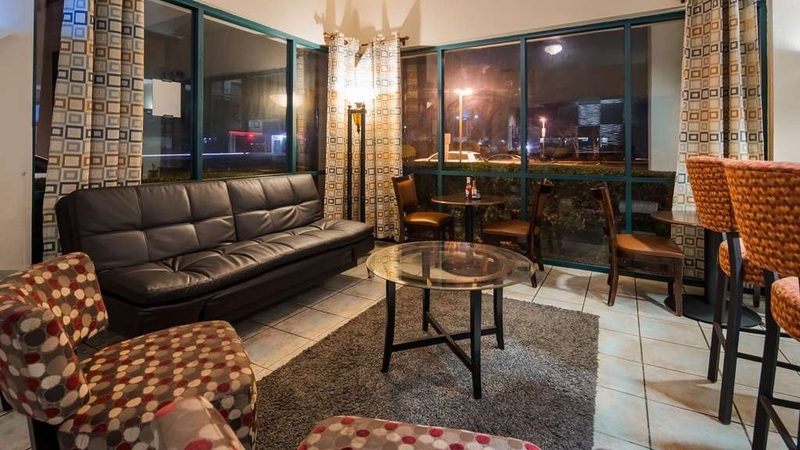 "great expericence to enhance attending a concert"
got a great price for a great room and amenities making the concert trip a superb over nighter. most convenient location to shops and restaurants. booking on line was the way to go and hotel staff were professional and gracious. We attended the Chicago/Doobie Brothers concert at Concord Pavilion and wanted a convenient location to stay. Best Western Heritage filled the bill! Comfortable room, wonderful staff, and a great breakfast! Excellent value for the price. Great bargain value for the nice clean room that you get. Quiet, peaceful and enjoyable. Good location. Great Staff! Will always stay here when going to the Bay Area. Close to good restaurants and entertainment. Thank You All! The hotel is doing some renovations, the only thing that impacted our stay was they removed the laundry room and installed a Gym, however about a 2 blocks away is a coin laundry that is really inexpensive. I had just checked in to this hotel after leaving a Best Western in nearby Oakley and this property was a massive downgrade. My room was okay, it had a Jacuzzi bath tub, but it smelled horribly like mildew and smoke. The front desk staff was nice and helpful but the maintenance staff at night were just constantly smoking from insides their storage rooms. A lot of riff raff I three other rooms smoking in their rooms and drinking. The spa was down and their ice machines were not working either. The breakfast area was very cramped and you required a voucher to enter. Of all the Best Westerns I have stayed at in the last few months, this one was the worst. Avoid at all costs. 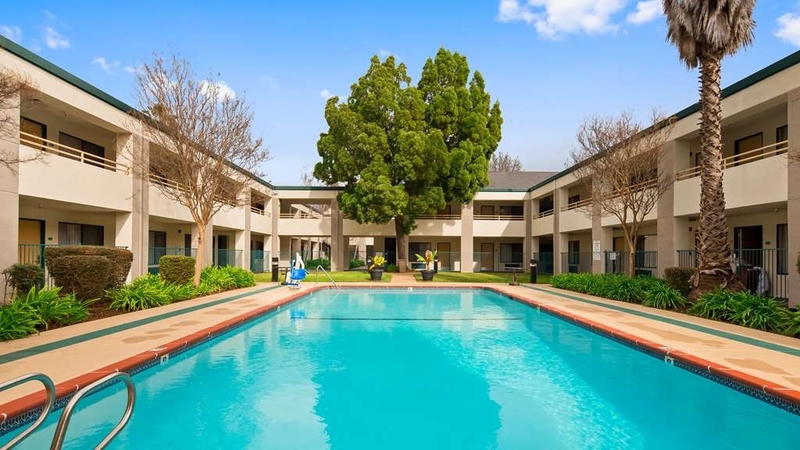 Staying in the San Francisco Bay Area is expensive but this BW is easily accessible to the whole area, has a great pool and lots of rooms. Very affordable and provides great service and parking. Located in Concord in a central location, good roads, close to large shopping areas, and close to restaurants and fast food services. This is a good place to stay. The room was spacious and had a microwave, fridge and little kitchenette sink. The bed was also super comfortable. The breakfast had a good variety of items which was nice. I would recommend this hotel. Front desk staff is not professional at all. Harrasses you and misinforms you. Lazy and not knowledgeable. They don't knkw anything or want to help. Treat everyone different. Every guest should be treated fair and equal Very few at front desk that made stay pleasant. This hotel was clean, the staff was kind and helpful when I needed something. I would appreciate a more variety of fruit at breakfast, this is California. The rooms could have had more light in them but the bed was very comfortable. Good Staff. Good Rooms. Everything was great at this hotel. The eggs, sausage, and waffles were good. Great coffee also. My wife enjoyed the beds and pillows. She thinks Best Western pillows and beds are great. Nice and courteous service, very accommodating, clean environment, fast internet, good breakfast, everything you need the service is really fast. 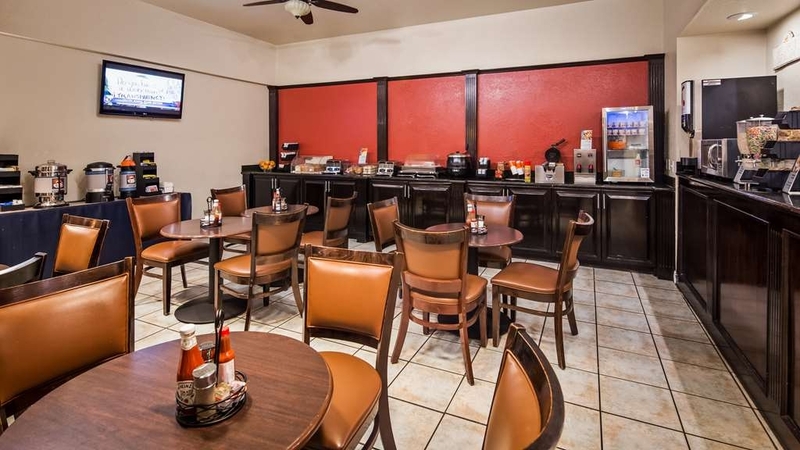 Located in the middle of the city all around the corner, fast foods and few miles from the shopping center and parks. Enjoy the stay and beautiful staff!!! I think the hotel is under construction/renovations. I would wait until they are complete before booking. Gap on door allows smoke to enter room and light. pipes in between wall are audible. beds not very comfortable. this was a business trip and alarm clock was not set for SPRING and was up an hour later than needed. "Great Inn, Friendly Staff & Nice Buffet Breakfast!" We stayed here for a week, & the staff here were very helpful & friendly, rooms were clean, there was a decent amount of cable channels on the TV & every morning there was a buffet breakfast served in the lobby. This location was convenient to relatives house we were visiting. Who knows why they named it Heritage Inn. I grew up in this neighborhood and it has nothing to do with any local heritage. It is located on what once a quiet country two lane road through farm country. Now it is on a very busy 4 lane thoroughfare populated with fast food franchises and convenience stores in strip mall zoning. It is a very dated old time motel with a depressing lobby and drab rooms. Our room required running the air conditioner all the times because the window wouldn't open. The bathroom had mold in the corners of tile work. The toilet and bathtub were inadequate for grownups. There is nothing to hold onto. The refrigerator ran all night with a constant humming. "Good stay for the location"
I am disabled and need a few emanates required in a room. The only requirement meet was the room was on the first floor. No grab rails in the shower, and the shower valve had a very small sweet spot for water tempterture, also it was a whirlpool tub which made it that much higher. The room would be very nice for most people. "Good hotel, Good prices , Good Staff"
Stayed here on a business trip. The room was clean, neat and everything worked well. The staff was very pleasant and gave me a great recommendation for a local restaurant. I didn't use the pool however it appeared to be clean and in good condition. "Better than their Martinez property"
Having had the privilege to stay at most BW properties off the I-680 and the Concord location being 1 of 2 owned by Heritage in this area, it is a fairly average property with a wonderful hotel staff. When comparing it to the price point of other BW properties in this general area, the list price is higher than it should be for the remoteness of the location relative to highway access...but a great deal if you're only other choice is Martinez! We stayed here due to location, typically I avoid Best Western. I wasn't let down...this one was the same old, not a great place. The breakfast is OK, but it certainly is the typical out of a box type breakfast in a tiny cramped space. I will say the room was pretty large with room to move around. Just a heads up....they do not have elevators, all the halls are outside, and the pool does not have heat. Overall, when traveling anywhere Best Western is my place to stay. Free breakfast in the morning and wifi available. Don't usually use the swimming pool, depending on the weather. But this was our second stay here. We enjoyed it, loved the location, a lot of store is walking distance from us not only that, but all a lot of restaurants around so didn't have to travel too far to get something good to eat. Easy checking in and out. Great customer service. Staff was very helpful and generous. The hotel staff were friendly and welcoming. OK deal for the amount of money. Need some structural improvement but staff made it better. Breakfast was better than some places but will be much improved if designed a bit better with more spaces between tables. The business area was in the hallway without much privacy and no working printer. The staff let us use the front desk computer for boarding passes. The staff compensated for the structural design flaws. Great stay,for a great price will be back again.breakfast was superb on a daily basis.housekeeping cleaning and front desk service all went well,morning newspaper everyday was provided at front office. "A Tale of Two Visits"
We stayed here in September and I would have given it three stars for being a good basic affordable Best Western with a nice pool in a courtyard. Last weekend was a different story. We had no wifi in our room or at the pool. When I asked the staff, they had their IT department call me. This young man from a very distant call center had me reconfiguring my 3 different devices. After 15 minutes I realized this was the hotel's problem, not mine to solve. If the staff had merely told me they were sorry, the wifi was out, I would have gone to a Starbucks and saved a lot of aggravation. Also: when I checked in at 2:45--admittedly early--my requested poolside room was not ready. I accepted a room on the parking lot. It was noisy, with people walking past and talking all evening. And the trees dropped sticky sap on our parked car. Not a good visit. Good night sleep is priceless. Sometimes you just need to get away from reality or life. A quick trip may be all you need to refocus and see what is important or not. And some times all you need is a good night sleep. This is a fairly quiet property a little off the beaten path. The rooms are a good size, nice TV, comfortable bed. There is a courtyard pool that gives a nice atmosphere, but not heated. If you are an Alaskan you just might enjoy it. However, it is an older property and the decor and furnishings are dated. But the real problem that I experienced was no hot water in the morning. Not just once, but every one of the four nights of my stay. The front desk clerks mostly made feeble excuses, and there was no action or response from management. True or not, I actually believe they turn the water heater off during the night to save energy. For me, this property absolutely does not live up to the Best Western standards I have come to expect. Stayed here three nights on business since it was the cheapest hotel in the area. I normally do not have any major issues with Best Westerns, and this was no exception. However, lots of little gripes I have knock the rating down to three stars. Upon check-in after a long day, the lady at the front desk tried to stick me and my colleague with a one bedroom room and not a two bedroom room like he had reserved. Then she tried to stick us in a smoking room, again NOT what we reserved. After way too long of a time haggling and trying to explain/show her ON PAPER what had been reserved, she told us there weren't any rooms of that type available except for a handicap room on the first floor. So we were stuck in a room that was a little more spacious in the bathroom area-ok, no big deal. Just wish we hadn't gone around in circles for 20 minutes at nearly 11PM with the front desk lady. 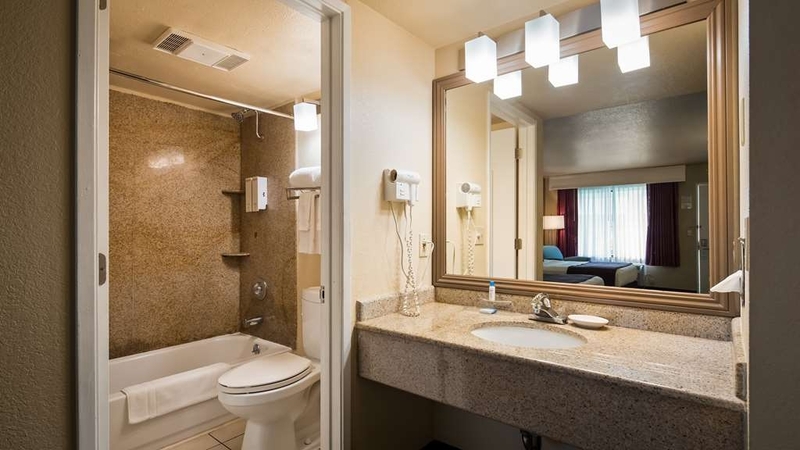 For a Best Western I was disappointed at how grimey the shower was especially. The rest of the room was pretty clean however. Pillows were very lumpy, but after my usual restless first night in any hotel room I slept fine thereafter. Hotel is set far enough from the street that we didn't have any noise issues with our room that faced the street. However, the window wasn't sealed completely and was loose, so what little noise we did hear from people passing by and what not seemed amplified. The continental breakfast seemed pretty limited to me. Seems like they took up 1/2 the space with utensils/condiments/drinks than they did with actual food. Just two types of cereals, some pieces of toast, cinnamon rolls, a waffle maker, sausages, and some really lame, obviously pre-packaged omelets. By our last morning (Sunday) they had swapped out the omelets for some other premade "egg disks" that were pretty bad. A huge group was at the hotel that day, so there was no seating in the main area, but they opened up a conference room for everyone else. Tried to get some help from a worker at breakfast on what types of cereal they had sitting in the conference room that looked like it was part of breakfast, but she kept dancing around my question and tried to keep directing me to the two lame cereals in the main area that was clogged with 12 year olds. After five minutes of just trying to get what types of cereal they were I finally gave up and went back to eating my boring omelet since she obviously couldn't give me a straight answer. For what we needed, this hotel did just fine. Didn't spend much time at the hotel, but it was just as well that we came back late and left early. We were looking for a place near Clayton. This was conveniently located, quiet, and comfortable. We had a room off the road, back by the pool. There was no road noise and the beds were very comfortable. Recently my wife and I had occasion to stay here for 3 nights while visiting family. While not a new facility, you couldn't tell as it is well maintained and clean as a pin. The room was large, well appointed, and very comfortable. The staff was friendly. While the free continental breakfast was not a must for us, we ended up eating it every day. OUTSTANDING! We have stayed at places having a much higher price point that were far inferior in every aspect some not even offering a breakfast. Would definitely stay here again. However many stars we could give this property, we would give them the most. Great value! It was a great place to stay due to the fact that it has the parking next to the room and very easy to get in and out of it. I wish this place were be closer to my destination but still it was very peaceful for the only one night. Especially, it was on the holiday too the price are reasonable as well too. I expected far more from this hotel. In concord, nowhere near a freeway, $130 should have gotten me at the least a comfortable bed with quality bedding, a decent breakfast and fresh in room conveniences. But that wasn't the case. Save your cash and stay elsewhere. 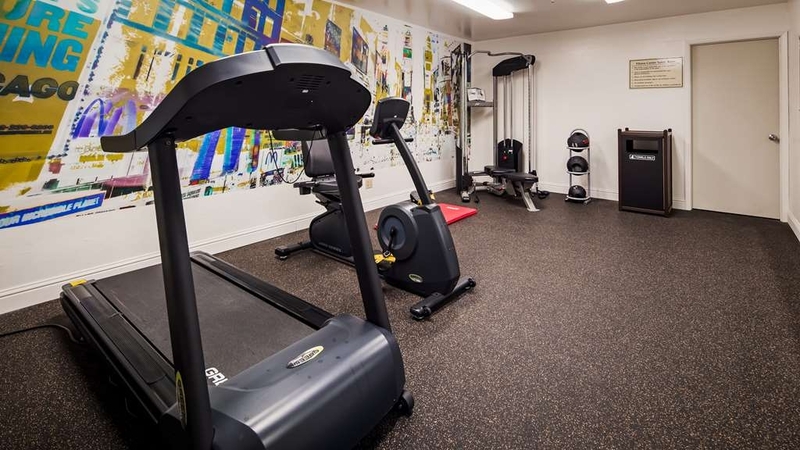 Perfectly located for activities in San Francisco Bay Area with easy access to main arteries without the traffic (pick your travel time, folks). Excellent service and quality for your money, and comfortable rooms with lots of outlets!. Knowledgeable staff and very helpful if needed. Paid higher price for room with jetted tub only to discover the jets did not work, towels were stained, and there was mold around the tub area. No discount or express check out offered - what a shame. Would consider twice before using this facility again. Love the location. It's in a quiet part of town with plenty of restaurants within a mile. We were attending a memorial service for my husband's sister and brother-in-law and the church was very easy to find from this hotel. There was enough handicapped parking so it was easy for my husband to get from the car to our room. We would definitely stay here again if need be. "Concord Best Western Heritage Inn"
If you need a crib, you better check in right at check in or you won't get one. Despite requesting a crib at check in, I was told they only have one crib for the whole hotel. Plugs don't stay in sockets. Breakfast was fine. Great Value for very nice Motel! Good location. Very helpful staff. Nice pool area. Safe & convenient. Quality of room was very good. I would stay here again and again. Everything was in good working order. Hotel was nice and easy to get to. Good breakfast. My room had smoke smell in it but my moms was clean smelling. It is a non-smoking hotel so I was a little disappointed in the smell. We were staying for less than 10 hours after arriving very late so I did not ask for another room. Every other aspect of our stay was pleasant though. Staff were very accommodating and were quick to check us in and out. Staff were also very personable and helpful. Unfortunately we had a very loud family upstairs above us and we were too tired to move rooms but something tells me the staff would have accommodated our needs. This was a good value for the price. It was clean, quiet and the room was larger than most hotels. The breakfast was adequate and the pool area was very nice. I would stay here again. This location was easy to find and there were many places to eat and shop within walking distance. I stayed here while visiting my son, who lives nearby. The room was large and very comfortable. It also had a small refrigerator and microwave. I was on an upper outside floor, which I would recommend over a 1st floor room, unless you have trouble carrying luggage. The rooms at the very back looked a bit dismal, but the ones facing the pool or on the sides seemed quite nice. The pool area at this hotel is nice, but the room we were in was in need of serious remodeling. It smelled like a combination of curry and mothballs in our room, with a flowery carpet cleaner scent to try and cover it up. We were originally scheduled to stay two nights here, but only ended up staying one because of the smell and lack of comfort in our room. "SAVED from sitting i traffic!" We KNEW we couldn't make it to Yountville after it took us 1 hr 15 minutes to go 10 miles so we looked up hotels on trip advisor and got off the freeay. This was easy to find, had parking right in front of our room, a pool, clean and offered breakfast in the morning! It full filled all of our needs! That is NOT to say it was perfect and couldn't be given some attention to the bedding (small hole in sheet resembled cigerette burn?) and tattered bed spreads/ covers on top of bed spread! I arrived just before 11:00 PM. The lobby was locked up and there was a line at the bullet proof security window. Each guest required about 20 minutes to check in. There were problems with each gues and most had to return to the bullet proof window several times. I had reserved the room on my corporate visa card ($10,000 limit with about $9,000 remaining) through my corporate travel agency but the clerk still insisted on $100 Cash deposit (cash only - I have a feeling I'll never see that $100 again). The water pipes in the next room vibrate so loud that it almost covers up all of the other noises in this complex. And, wifi doesn't work (I'm on my cell phone hot spot). I'm guessing that some of the "guests" might be renting by the hour. I'll switch hotels in the morning. old tired looking rooms but they were clean. how about leaving food in common eating area for breakfast at least 10 min. past 9:00 a.m. just so us slow eaters can get seconds. also, stairs are difficult to navigate after knee surgery. A little help here? The room was very nice. The front desk employees were exceptional and went out of their way to ensure I would enjoy my stay. The free hot breakfast was better than most. Would definitely stay here the next time I'm in the area. Was very comfortable and service was great. Beds were good and so was the air conditioner. Good continental breakfast too. And the pool was great as we were there during a real heat wave. Was very close to our destination and had plenty of food places and stores nearby. Good part of town. 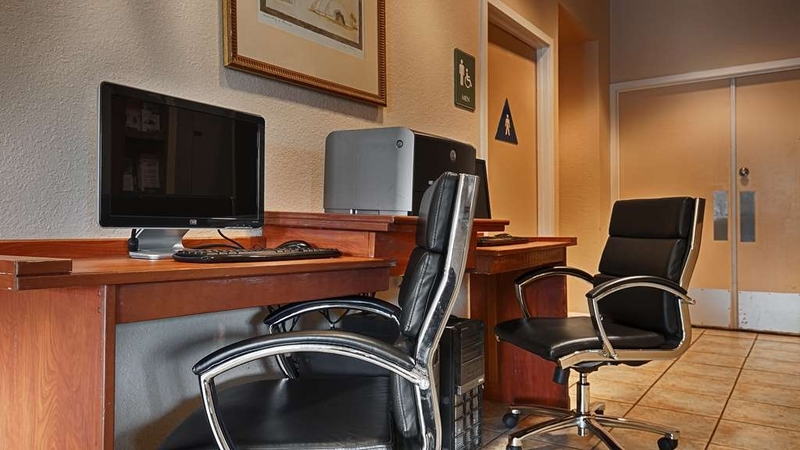 We chose this motel for its convenient location when visiting family in the area. 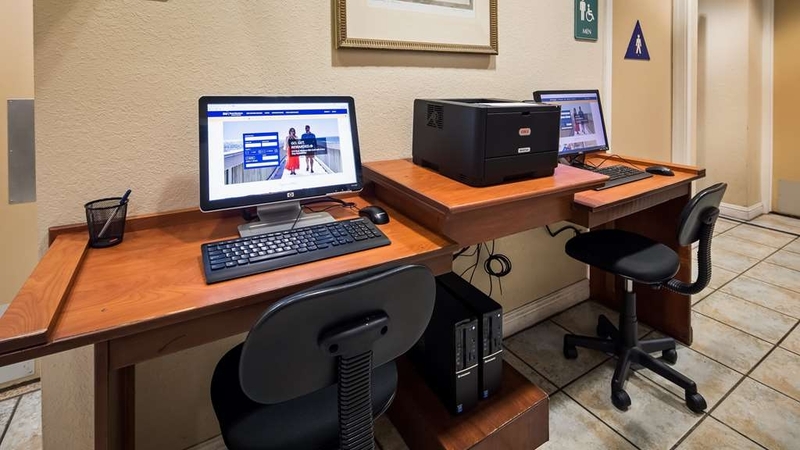 Although it is not in an upscale area, and is not a Best Western Plus or better, we found that it provided a comfortable place to stay at an excellent price. The staff was friendly, and the usual Best Western breakfast was hot and hearty each morning. The place is dated, but the room was clean and the bed comfortable so that was a plus. I didn't discover until we arrived that there is no laundry on the premises - which I always have counted on with Best Westerns - so we did our laundry at a family member's home. All in all, we certainly got our value out of the several days we stayed here. This hotel is in a very convenient area. The bank was right across the street. Not only that, but had plenty of restaurants surrounding it. All walking distance from the hotel. The staff are very helpful and courteous. We also enjoyed the breakfast and we're very satisfied with the stay. We would definitely stay here again. I was a little worried when I showed up late on a Saturday and there was a security guard and you had to check in through a window. There were a few people who looked like they were partying at the hotel. The computer system was down and things just weren't going well. The woman who was checking me in did her absolute best to help me and was very friendly (even while stressed) even though she couldn't pull up my reservation. She made copies of my info and told me to return to the front desk in the morning. The rooms were basic and clean. They did not have the pillow top mattresses many of the Best Westerns have these days, but the beds were comfy. The hotel was a little dated but very clean, and the cosmetic problems in the room were very minor. I slept well, and with the fan on I did not hear any noise from outside or other rooms. The hotel looked much friendlier by daylight. There were kids swimming in the pool and everything looked cheery. The breakfast is very basic, but the eggs were those omelettes that look like they were frozen. Score on the blueberry waffle mix though! They also had hard boiled eggs, so that helped. As is the norm, they had pastries/breads, cereal and some fresh fruit. The hotel is located near a lot of places to eat. You really have your pick. We were getting in late each night and picked up pre-made food at Safeway just down the street. When we wanted to sleep in and missed the hotel breakfast on the last day we just went over to IHOP across the street. I stayed here while attending a music festival in Napa. The drive to and from the festival was not that bad and the price was worth the drive. "Not the good Best Western beds"
Stayed in Room 165 the last three nights. The bed was uncomfortable and sagged in the middle. Pillows are hard, property dated but maintained. The toilet was the loudest toilet I've ever heard. After flushing you have to keep the door shut until it finishes so you don't wake the family. The shower was also very noisy and the water temperature fluctuates so when another room uses the hot water your water is cold. Oh yeah you can also hear your neighbors flushing and showering. $432.00 for 3 nights. We are repeat customers who demand a clean, comfortable and well-maintained property. The staff is attentive and helpful. Breakfast options are many and varied, unlike some competitors' "continental breakfast". "Good Stop in Concord, CA"
This was a very convenient and good stop on our way south. The hotel was located in a nice area, close to some restaurants with easy access to the Interstate. 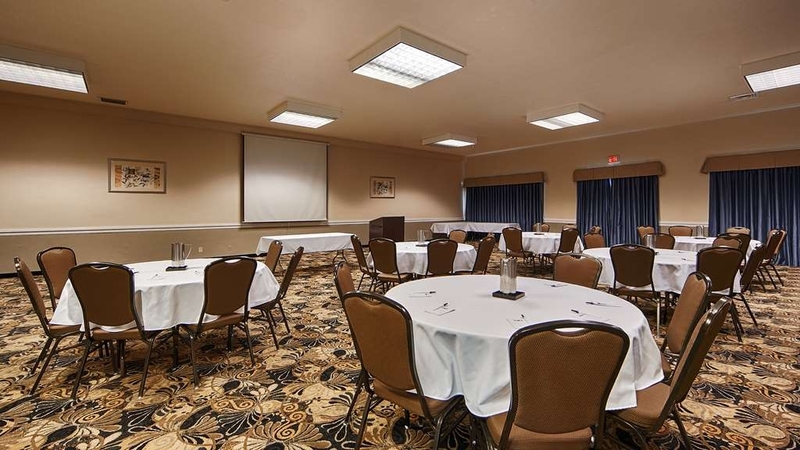 The personnel were friendly and efficient and the room was spacious, well appointed and clean. Breakfast was better than the normal BW breakfast and the price for the room good. The front desk area was very organized and clean. The front desk clerk was very nice and made me feel at home. My room was clean. Very nice TV compared to the many other hotels in visit. I do wish for a better pillow, however I slept well in the room. As for the breakfast, it was in the top 10 percent of all the hotels in have stayed at. Spent three days and two nights at this location. The staff, the room, the breakfast, and high speed internet greatly exceeded my expectations. Next time business takes me this locale, I'll definitely stay there. People were very nice and helpful. Room was clean and in good shape no problems with the exception of adjusting the shower temp. Breakfast was typical nothing special. I would recommend it and will stay there again. the price for the night was a little high for the area and the room smelled like smoke from cigarettes; but the staff was nice and helpful I just could not get over the smell the bed was nice and the room looked clean with a lot of floor space but the smell was intents. We stayed at tis two-star motel for almost of whole week. We hose it for its low price. Not bad, but it needed some help - a new mattress would have helped, and the bathroom needed a redo. I guess the rug was OK, but it looked dirty.. Guests included college students on spring break and construction workers from out of town. I had just lost my sister to cancer the day I stayed at this hotel. I had been up all night holding her hand watching her die. When I got to the hotel it was a motel, two floors, stairs to climb instead of elevator. The staff were accommodating but didn't want to hear about my reason for checking in a day late. They gave me a room right next to the stairs and all I heard was the banging of suitcases up and down the stairs. The walls are paper thin and I had to listen to a gentleman's phone call. There were kids yelling and running all over the place and parents yelling at their kids. The room was old and depressing, the bed hard. The tub was so stained that I couldn't see myself showering in it. I had to pull the curtains due to the passage way being right outside my window and people would look in. I lasted 2 hours and had to leave. The girl behind the desk wasn't interested in my reason for wanting to leave and charged me for the 2 hours I was there. I just wanted someone to care at that moment and they didn't. I come back to Concord often as my Daughter and Grandkids are here and I've made Best Western in Concord as like coming home. 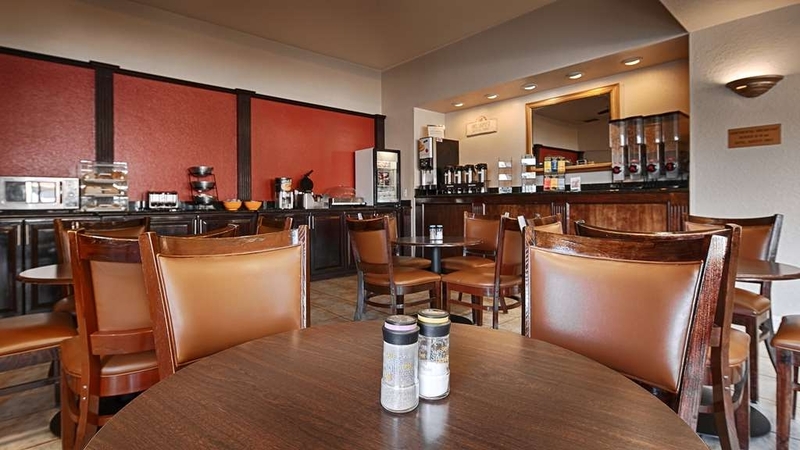 I travel throughout the World for mostly business and I know what kind of Hotels I require and Best Western has met my needs and Breakfast is good. We arrived late at night (late flight) and staff member was rude. They could not find my booking. The property was not clean, the rooms were small and the sheets were definitely used. We were all itchy. The pool also dirty. The breakfast included in the room rate was terrible. The staff were also very rude. It is noisy and not good value for money. We were supposed to stay for ten days but I checked us out immediately and found a better hotel. Although nothing spectacular, Hotel was clean, plenty of parking, roomy guest rooms. good value considering the cost of other hotels in the area. offering a better breakfast would be an improvement. Don't expect anything more than microwave style basics with juice, milk, cereal and waffles..
"This "non-smoking" hotel reeks of smoke." I arrived the evening before a business meeting, and decided that sleep was more important than a fresh-smelling room. Bad idea. When I asked the next morning whether the hotel had previously allowed smoking, the desk clerk confirmed that it had, "But not in your room." I felt ill for three days after my stay. The room had a musty food odor. The white top bedding had dark smudges. the pillows were broken down and not supportive. The cloth easy chair had streaked stains in the middle of the seat cushion. Staff failed to deliver check out receipt at door as requested. The breakfast was typical. The coffee descent. "renovation nice but wind & leaves blew under the door"
Upon entering the room I was impressed with the size, appliances, renovations and cleanliness of the room. I noticed some leaves in the doorway in my room and thought it was odd but assumed they blew in when me or staff was last opening the door. Then I left for a bit and when I returned there were even more leaves scattered throughout the floor and then I noticed the gap under the door where wind blew in. Staff called to ask how my stay was going so I mentioned the problem and she suggested I use a towel to block the gap and asked if I needed more towels. Ultimately, I used a towel and decided it wasn't worth it to relocate. Noise from outside was quite loud but that was to be expected. Aside from a strange splatter on the wall the room was clean. We originally planned to stay only two days, but extended our trip, and spent the time relaxing and enjoying the hotel and Concord area. The Spa/Hot Tub, being indoors, was very good, and the breakfast was good, with good selection. We stay here when visiting family. Facility is dated but we'll maintained. Staff is friendly. Price is definitely affordable. Free breakfast is very good quality compared to the other chains. Location is convenient to shopping & restaurants. "Nice room, wonderful breakfast, but we were cheated..."
We booked a room in early December through booking.com so the hotel didn't have our credit card number. We were asked for our card when checking in and were told that a $100 hold was being put on our card for potential phone/damage charges. No receipt was given. In the morning when checking out, we were told that the hold on our card was released, and no charges were filed. I asked about a receipt, but was not given one. About five hours into our trip home, we received a call from our credit card company asking if we had authorized a $100 charge made on our card by Best Western...many hours after being told that the charge had been released. Luckily it was straightened our with our credit card company without difficulty. I called Best Western to complain and was assured that they would investigate and call me back. It's been more than a week now and I haven't heard, so I decided to write this review. Check your credit card after staying at the Best Western Heritage Inn in Concord, CA!! I had some my workers stay here on Dec 12th and when they checked into the room they found a used condom on the bed, when brought to the front desk attention they said they could only give a 10% discount. When I heard about it I called the manager and after being put on hold for close to 10 minutes they said the manager was on a break and would call me back. After a day later I am still waiting for a call back. I would really stay away from this hotel and go to the Comfort Inn down the street. Hotel staff welcoming, and our room and amenities were all working! They also had a very nice pool. Breakfast was available with a variety of hot and cold options. Restaurants, grocery stores, gas stations and other types of stores are conveniently close to the hotel. 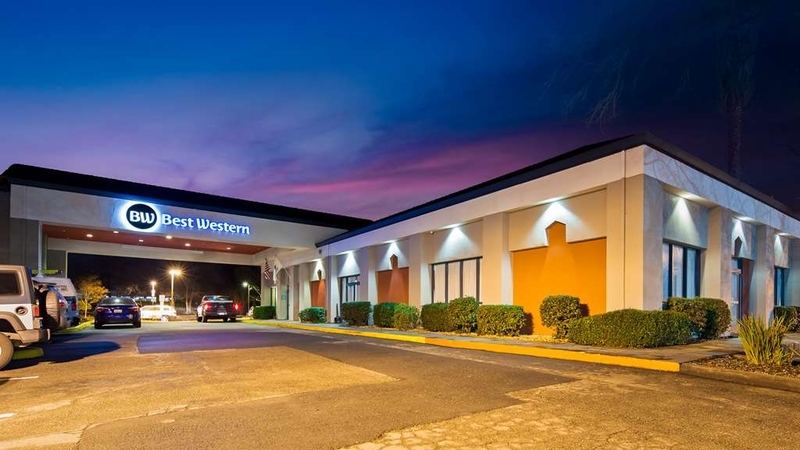 "the worst best western I have stayed in !!!" I am so disappointed in the location! I have never been so inconvenienced by a hotel before. While relaxing with my fiancé our tv stopped working. We called the front desk and they made us switch rooms at 7 pm . They could have brought us the TV and let us relax but instead we had to pack up everything and were put in a room not nearly as nice as the first for the same price. Not happy at all !!! I will be contacting corporate since I am a rewards member and have spent a lot of money in best western. ..... ?????? I have stayed at Best Western Heritage Inn Concord a few times now, just for a private quality time with my boyfriend. 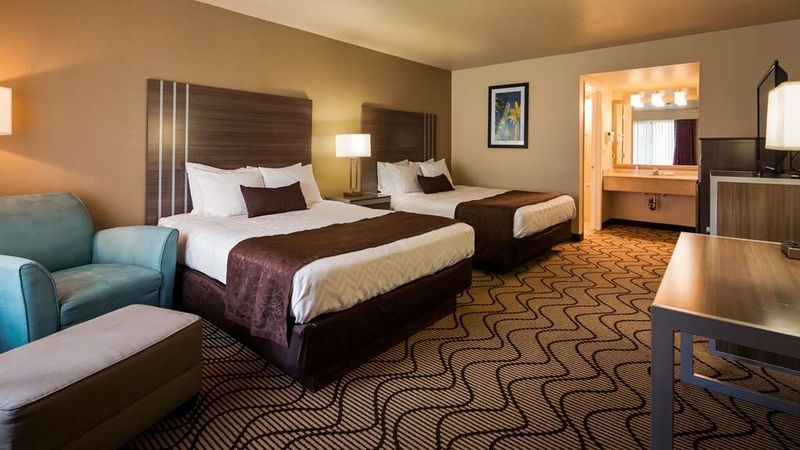 The rooms are always clean and roomy with a big HD TV and comfortable king size beds. Rooms also come with a fridge & microwave. There's a Nations just across the parking lot and in walking distance to everything. The only downside on our recent visit we had a noisy rude family in room above ours, it can get a bit noisy on weekends as they have a lot of party events there but still a decent place to stay in great area. 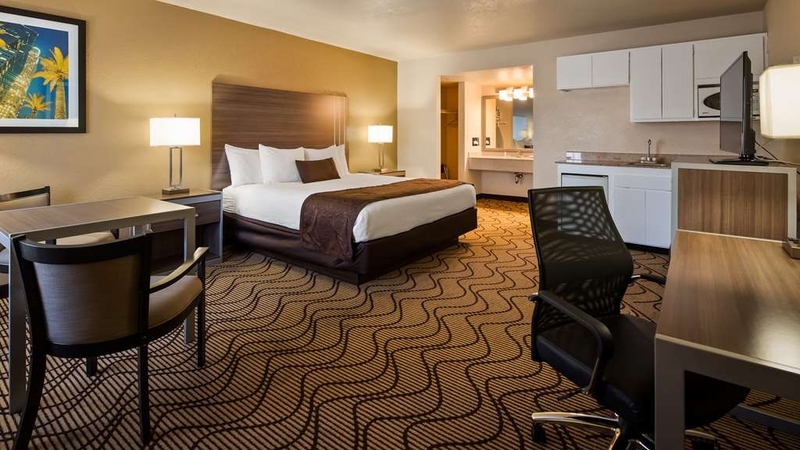 "Not Bad for Business or Construction Travel"
They were very helpful staff, They answered any questions when asked, the rooms were clean the beds were very comfortable with lots of space, always plenty of fresh towels. The breakfast was splendid so many choices and even a grab and go offerings, they are close to so many resturants, as well as close to public transit and BART. This hotel was very nice, and a good value for the money. Beds were very comfortable, and rooms were clean and functional. We stayed 2 nights. Breakfast was the standard fare, adequate but nothing special. Lots of places nearby to eat. "A reasonably priced place in Concord, CA"
This is a reasonably priced place to stay in Concord, CA. The hotel is a little out of the way if you have business in Walnut Creek. Rooms are clean, and the staff is friendly. If you are looking for a clean place to stay, this may be your place. I found this hotel to be clean, with a spacious room . It was quiet in a quiet part of town. Unfortunately the wi-fi was down in my section, but I was offered another room (which I declined) and the tech guy really tried to get it fixed. I would definitely stay there again. Easy access, cleanly room, friendly service, and wide breakfast variety. Check in was fast and easy, and check out easier. Many local restaurants and street access was fine. I recommend this hotel. Price was right for me as well. Very convenient location for visits to areas both east and west, north and south in central California. Surprised at how well it is managed now (stayed there 30 years ago and it was not so good. Best Western has upgraded and maintained the property so it is comfortable and had lots of folks but still quiet in the room. You can bet I will stay there again. 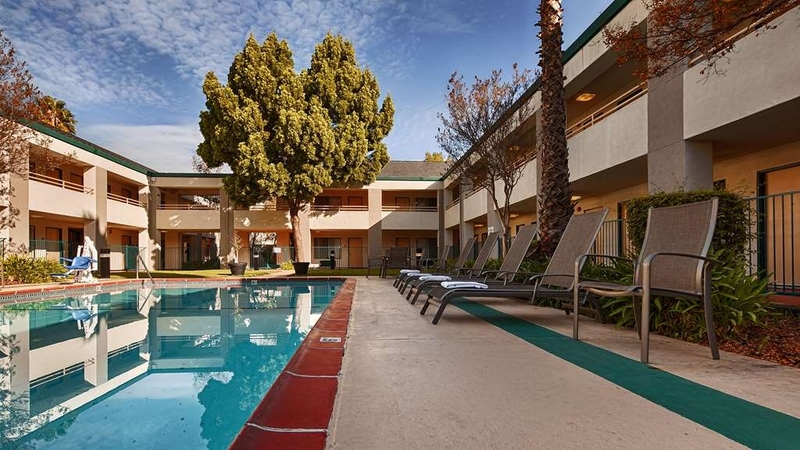 "Best Western Heritage Inn, Concord, California"
The Best Western Heritage Inn located in Concord, CA, was clean, and pleasant on check in. On second day of stay, malfunction in TV remote occurred. After reporting remote malfunction, the front desk and maintenance employees were efficient and pleasant as they worked to resolve problem. Front office staff, cleaning staff, maintenance staff were all very professional and pleasant in their performance of service. Comfortable; clean and in a good location. The staff is very nice. I especially liked the lighting over the bathroom sink. It was very nice and not harsh. It may sound silly, but starting my day out not feel like a troll (floresent lighting) makes a big difference on how I approach the day. There is also an excellent Mexican restaurant directly across the street that the hotel recommend. Nice rooms, beds were comfortable. Restaurants in walking distance. Quiet area at night. Definately will stay here again. Rooms are clean, nice breakfast I need the morning, staff is friendly and helpful. it was alright, just uncomfortable to see that employees bring their drunk friends to hangout at work, there should not be people behind the desk that doesn't work there. it makes you feel like they dont really care about their job. The housekeeping staff are all pleasant and efficient. It's the front desk that needs to be more accommodating and helpful. 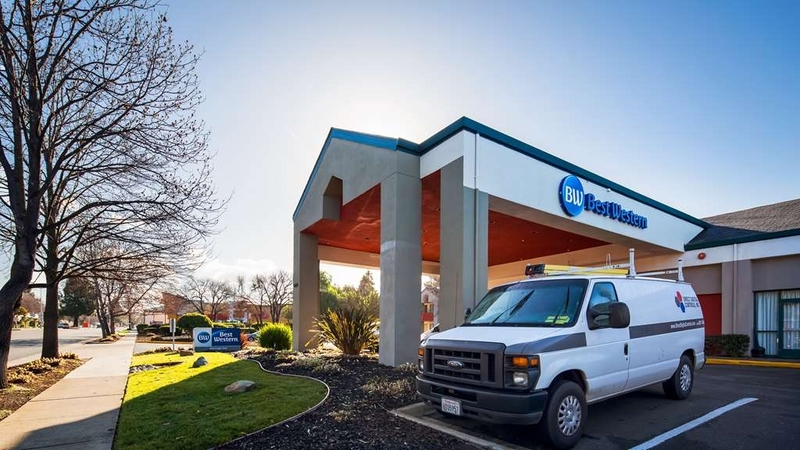 Just came from another Best Western branch in Sacramento and the staff was a lot more helpful. Staff at Heritage Inn Concord would just outright tell you for example that an airport ride thru taxi would cost hundreds of dollars but wont say anything else or suggest an option. It seems they're not well coordinated also. One directed us to the laundry area saying it's available but it was really closed. And we thought it was just closed for the day until another person told us the next day that it will be closed permanently. It's still a good place to stay if you already know your way around and does not need to ask the reception staff for help on additional information or directions. 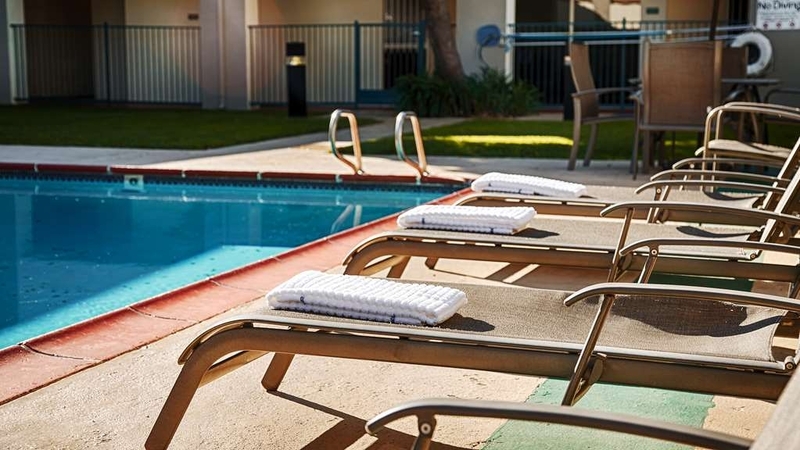 It's near several restaurants, TJ Maxx, gasoline station, 7-11 and 5 minutes away from the train station. I appreciate it that they have decaf option for breakfast coffee. Stayed here before, and our trip was nothing less than expected. Our room was clean, breakfast was free (not the best, but it's free), and everything went smoothly. Would stay there again. Close enough to the BART station if you're going into the city. This is a nice Best Western. The first thing I want to say is I am starting to settle in to most Best Westerns and this one is one of the reasons. Very friendly staff, good breakfast, nice room, great pool & hot tub. The bed runner threads were a little natty but I figure it might be because of pets. There was a dead spider in the tub but that can happen at any time. The rest of the room was very clean, smelled nice, the bed was very comfortable. There was plenty of light in the room for working. Enjoyed my stay. While staying at this hotel, our bicycle was stolen off of our truck during the night. We completed an Incident Report Form, but have not heard from the hotel's insurance company. It is an older hotel, and we were not impressed with it's general appearance or location. Unfortunately we got there after dark. If we had gotten there earlier, we would not have stayed there. Parking lot security seemed to be non-existant. this is a nice place to lay your head, but there are so many more convenient places to stay. To reach any freeway you must go through a maze to get there. BUT if you must stay in an AWAY place this spot served a good purpose. The bathroom was clean, until i reach the shower, which was not like the rest of the room. It was very disgusting. "Think Twice about staying here"
The room, facilities and service fell well below other Best Westerns that we stayed in driving west and continue to stay in as we continue north. We were told sorry but issues with the TV remote and an inoperable ac unit were only resolved after repeated requests and never resolved regarding the ac. The breakfast was OK, though. This hotel looks good on internet but the rooms do not match its look from the street. For price, you can stay at much newer hotel property. This property appears to attract busload tour groups that tend to be rowdy and noisy at night making it hard to sleep. Also, there were issues with old bed mattress and toilet that did not function well. We stayed here for a sunday night concert at the Pavillion. The hotel was clean, inexpensive and offered breakfast. I was able to book same day with a decent rate, and it is literally only a 5 minute ride from the venue. Uber it, worth the $! "Quiet hotel and friendly staff"
I often stay at this hotel for business, It is fairly easy to get to, yet far enough away from the noise of the freeways and city. The area appears safe and the hotel is clean and quiet. The staff is extremely professional. The rooms are clean and comfortable and very spacious. "Outdoor concert, here we come!" We went to see the "Boy Band", 5 SOS at the Concord Pavillion. We were so close from our Hotel, it was amazing! We took about two or three turns following an easy route and we were there! The hotel room we had rented was on the second floor and overlooked the pool, which was quite special for the two teenagers I had with me. There was also an indoor Sauna and Spa which we used in the evening. The breakfast, included in price of your room, was great, there was a very nice, sunlit room to eat in and plenty of food! All the employees were very nice and accommodating.